I'm not exactly sure what brought it on but I found myself thinking about making a chocolate yogurt cake the other day. I think it was partly from eating yogurt that had me thinking about baking with it. I was thinking along the lines of a loaf cake because I pictured these great lemon and orange yogurt loaves and figured I'd love to try a chocolate one. Also, making the last chiffon cake had me thinking about great base recipes and making different versions from it. But when I looked up recipes ideas, fudgy chocolate chip yogurt cake from Mel's Kitchen Cafe popped up. I discovered this site pretty recently but I've become a big fan after trying a few recipes and getting some great dinners out of it. So I saw this easy chocolate chip cake and couldn't resist giving it a try. It's so quick and easy to make that I decided at the last minute, right before I started cooking dinner, to whip it up for dessert. I scaled the recipe down to make a little 6-inch cake for the three of us. All you have to do is mix dry ingredients in one bowl and whisk together some sugar, eggs, yogurt and vanilla in another (there's no oil or butter in this recipe). The two come together and you add a generous amount of chocolate chips. The chips are actually supposed to sink mostly to the bottom of the cake to make a fudgy layer at the base that's like a hot fudge sauce. Ironically, my chocolate chips didn't really sink that way! No worries because as long as you pull your cake out of the oven early enough, the cake will be nice and fudgy. It's melty and chocolaty, and it tastes a bit like molten chocolate cake, which is one of the best things on earth, in my opinion! I popped this cake in the oven as we sat down to dinner. It took no more than 27 minutes for mine to bake to this state but check on it early. It's very important to err on the side of slightly under-baking so that the cake is soft and gooey in the center. It will taste more chocolaty that way. Eating it warm is highly recommended. Eating this warm cake with some ice cream is also highly recommended. Is there anything better than a nice dinner, followed by warm chocolate cake served with ice cream? It brings a family together, I tell you! There is this wonderful suggestion of topping this cake with some chopped toasted almonds or toffee bits for a little crunch. I would have loved a little crunchy contrast but the fellas in my family prefer otherwise. So I just sprinkled my slice with a little chopped pistachios. This was a very nice quick & easy impromptu dessert that my family and I really enjoyed together. I divided the recipe in half and baked the batter in a 6-inch pan with removable sides. A small cake makes sense if you're feeding a small group because I think this tastes best fresh and warm from the oven (we warmed a leftover slice in the microwave the next day to mimic the melty effect and while it's good, the texture will be a bit more bouncy, slightly gummier, which we have to expect from a cake made with yogurt and without oil or butter). The original recipe for a 9 or 10-inch cake calls for 5 eggs and I used 2 extra-large eggs to keep things simple. I used 2% plain Greek yogurt for this cake. A Greek-style (thicker) vanilla yogurt (a bit sweeter) is recommended. I just added a little extra vanilla extract to my cake and it turned out nicely. I used 3/4 cups of chocolate chips - mainly Ghirardelli 60% with a little bit of their semisweet chips mixed in. The batter will be a thin one and whether or not your chocolate chips sink to the bottom, it will be delicious as long as you slightly under-bake it for the fudgy effect. This was a happy spur-of-the-moment bake! Preheat oven to 350 degrees. Lightly grease (or spray with cooking spray) a 6-inch springform pan or one with removable sides. In a small bowl, whisk together the sugar, vanilla, yogurt, and eggs until smooth. In a larger bowl, whisk the flour, cocoa powder, baking powder, and salt together. Add wet ingredients into the dry and stir together with a rubber spatula until almost incorporated. Add chocolate chips and fold together until just combined (don't over-mix). Pour batter into the prepared cake pan, smoothing the top. Sprinkle top with chopped nuts, if using. Bake until a cake tester inserted into the center of the cake comes out with some moist crumbs attached, about 26-27 minutes but check early. You are looking for the cake to be just set and slightly under-baked so it will be fudgy. Remove cake from the oven and let cool for about 5-10 minutes. Run a knife around the edge of the cake and remove the sides of the pan. 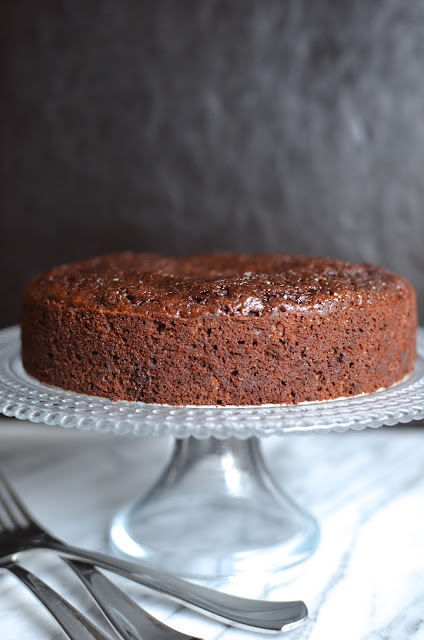 Serve cake while still warm (your chocolate chips will have either sunk mostly to the bottom to create a little pool of hot fudge or be nice and melty throughout), with a scoop of ice cream, if desired. Pulling it out of the oven early is the one thing I had to pay attention to. Otherwise so simple. Hi Monica, your cake looks so moist, soft and fudgy! And I'm a huge fan of Ghirardelli chocolate chips, especially the dark chocolate ones, yum! Those chips are my favorite, too. I always have a bunch and they really makes all my chocolate chip baked goods (I prefer the 60% dark, too). Thanks, Jasline! Oh my gosh, that looks INSANELY FUDGY and moist. I want to dive right into it. Warm fudgy chocolate is a straight path to chocolate heaven. Thanks, Joanne. haha - plenty of stir-fry and roasted veggies here, I promise, but I like to make some room for dessert. That's my idea of a balanced lifestyle. : ) It keeps me busy and lets me indulge in this baking/blogging hobby, too. Have a great weekend! Oh my goodness look at how fudgy that is!!! And I would definitely sprinkle with some pistachios! Sounds like the perfect finishing touch ... in addition to the ice cream! haha Have a great weekend Monica!! The ice cream made it very molten cake-like so I was loving that. Enjoy the weekend - supposed to be super nice here so looking forward to it! Wow, this cake looks so fudgy and delicious! 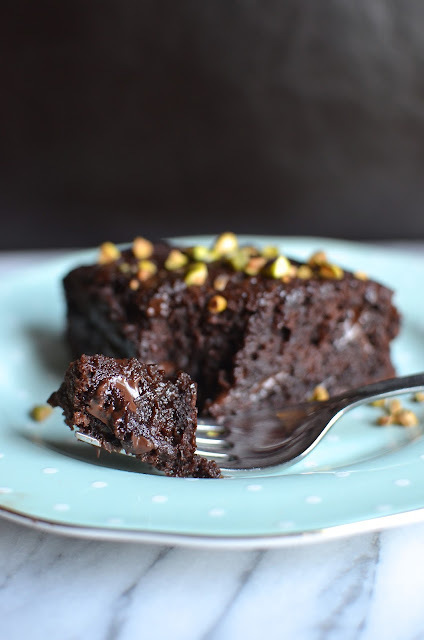 Love the greek yogurt in here and topping it with pistachios sounds just perfect! My cup of tea could sure use a slice of this chocolate heaven and a scoop of ice cream :) This is the perfect treat for Friday! Have a great weekend! Eating it fresh and warm, with the ice cream is so the way to go! I had the yogurt in the fridge anyway so it was meant to happen. Enjoy the weekend! They do always turn out very moist and spongy, don't they! Thank you, Consuelo. Hope all is well. Looks very moist Monica, I love baking things spur of the moment too, especially when they turn out. It looks so moist ! So fudgy! Love this cake a lot! Glad you like it...I really like how quick and easy it is and with the yogurt and no butter/oil. It was a fun, quick bake on the spur of the moment. Weekend was beautiful here, thank you! There is nothing better than a family dinner and this cake. I tell you, I can almost taste the warmth of this cake. 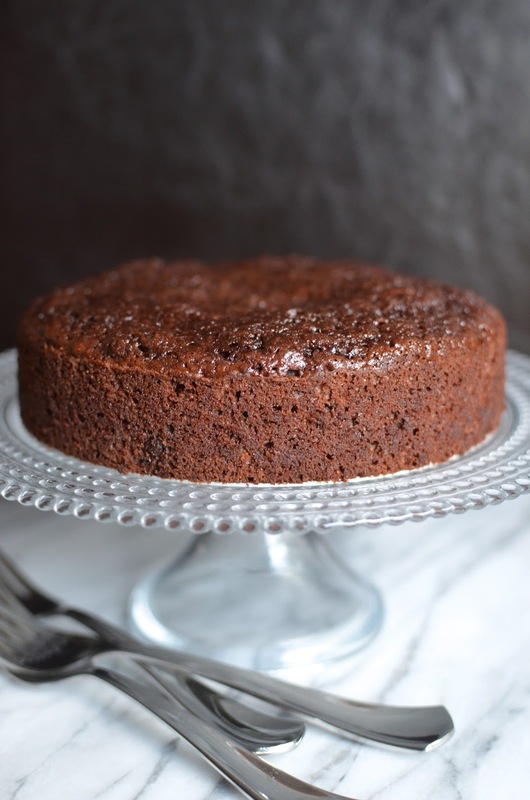 Perfect moist, gooey cake. You know the beauty of the family table. Some good food is a perk and helps bring everyone just a little closer together. : ) Gooey chocolate cake always hits the spot. Fudgy sauce within the cake...OMG! Nothing beats a good chocolate cake...this one came out of my dreams! Wow, I'd totally love to have this around after dinner tonight. Looks so good!!! Hi Amy!! This was a fun, easy bake. It's really good fresh and warm from the oven, with some ice cream.